Thank you Stonyfield for sponsoring today’s recipe. As always, all opinions are my own. Want pancakes for just two people? 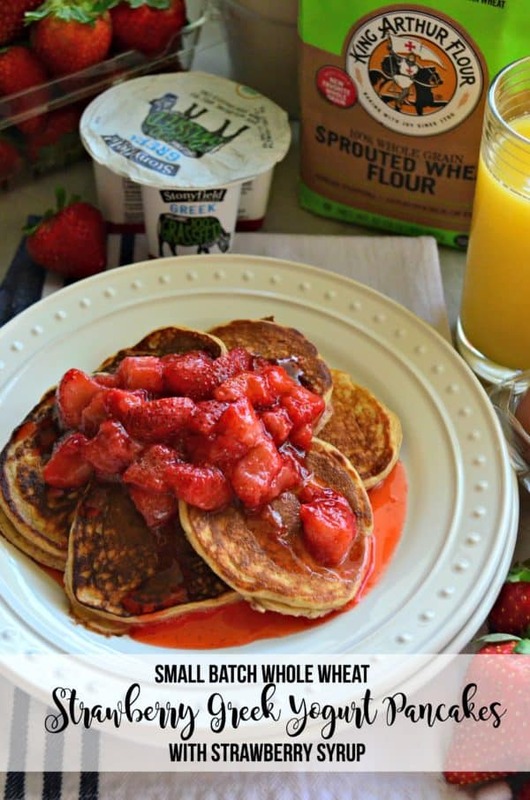 Try my 15 minute recipe for Small Batch Whole Wheat Strawberry Greek Yogurt Pancakes with Strawberry Syrup. I’m back again with a delicious and (once again) very quick breakfast recipe. Before I had the baby I stocked my freezer with pancakes… almost a month in from having said baby #2 and we are out of our frozen pancake stash. My toddler loves carbs and protein for breakfast (i.e., pancakes or waffles paired with either sausage or bacon). I mean who doesn’t love that combo? My friends at Stonyfield have a new Grassfed yogurt out. Last week, I shared my recipe for Banana Almond Butter Overnight Oats that used the Grassfed Vanilla Yogurt. Today, I’m excited to share with you that Stonyfield has a new Grassfed yogurt in town… it’s Grassfed Greek yogurt! You guys, I got to try it back in the beginning of February and was instantly in love with it! It’s not as tangy as traditional Greek yogurt can be and is much more creamier then it’s traditional counterpart. 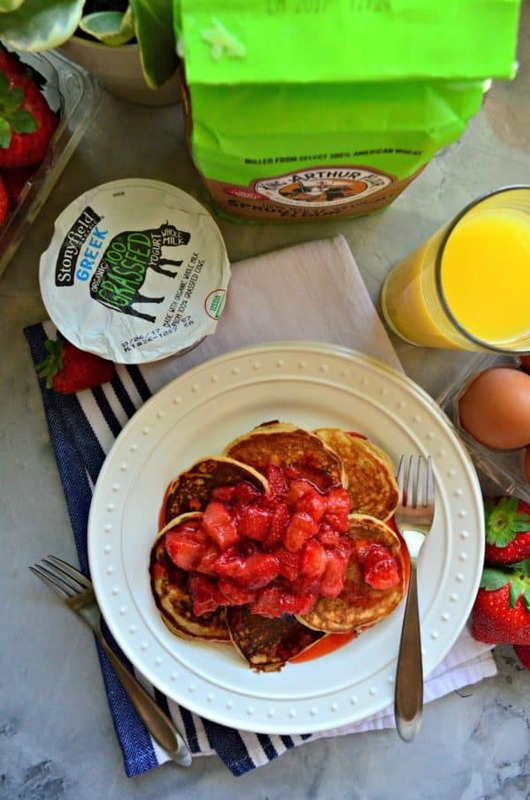 Making it the perfect mix in to these Small Batch Whole Wheat Strawberry Greek Yogurt Pancakes with Strawberry Syrup. 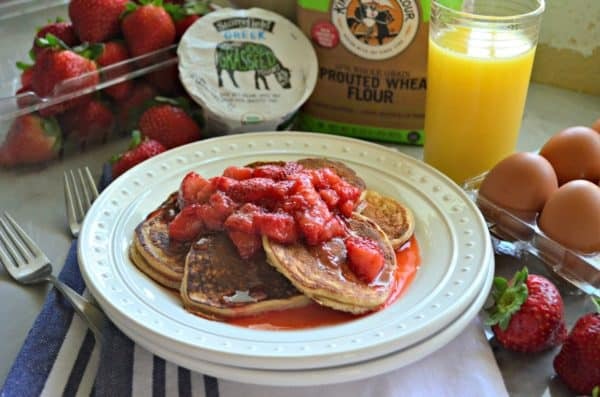 These Small Batch Whole Wheat Strawberry Greek Yogurt Pancakes with Strawberry Syrup take 15 minutes from start to finish. This includes making the fresh strawberry syrup and the silver dollar pancakes. Best of all it’s a small batch that makes 8-9 silver dollar pancakes. Perfect for breakfast for 1-2 people. Let’s talk a minute about the ingredients used in this recipe. 3 of the 6 ingredients all come from Certified B Corporation®. What does that mean? You guys know I have a love affair with Stonyfield. I love their food and their mission. Hence why I’m a brand ambassador for them. I feel good feeding my family food from Stonyfield. 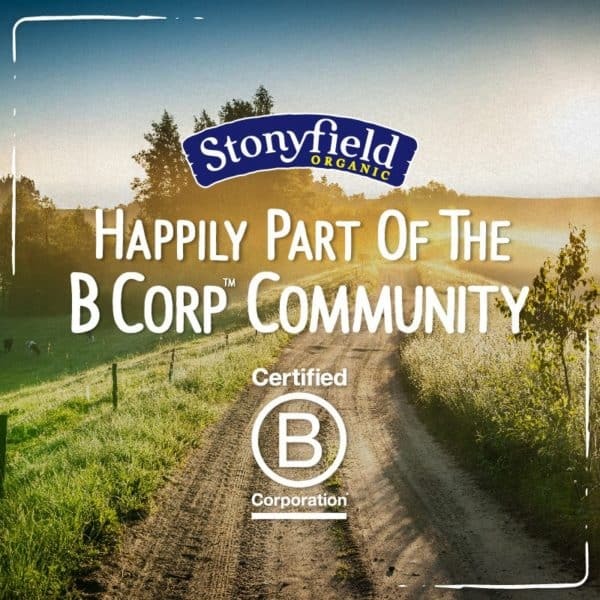 Stonyfield just joined the ranks (and scored a 92) as a Certified B Corporation. This is something that they will continue to work on and will always have to continue holding their certification and adjusting the ways they do business. But let it be known–prior to the certification they were already doing what B Corporation certification looks for. There are over 2,048 Certified B Corporation®! My friends at Stonyfield sent us some products from just a few of the Certified B Corporation companies: King Arthur Flour, Preserve Products, Purely Elizabeth, Pukka, Method and Pete & Gerry’s ! For this recipe I used King Arthur Flour and Pete and Gerry’s Organic Eggs (two brands that I always use and cook with). Your stomach and heart will both be satisfied with these Small Batch Whole Wheat Strawberry Greek Yogurt Pancakes with Strawberry Syrup. Not only do they taste good but you are eating for the good of others! In a small sauce pan, combine the chopped strawberries and the coconut sugar. Place on high heat, for 2 minutes then reduce to medium-low heat. Stir frequently. Once the juices have pulled out of the strawberries a syrup will form. Remove off the heat and set to the side. While strawberries cook, make the pancake batter. In a bowl stir together 1/4 cup sprouted wheat flour, 1/2 teaspoon baking powder, and 1/8 salt. Make a well in the flour mixture then add to the same bowl one, 5.3 oz. cup Stonyfield Grassfed Strawberry Greek yogurt and the egg. Stir yogurt mixture into flour mixture (the batter will be thick). Spray a large skillet with nonstick cooking spray. Pour about 2 tablespoons of batter onto the skillet and spread slightly with back of spoon. Cook over medium heat for 1-2 minutes per side (batter will start to have bubbles that's when you know to turn it). Repeat until all the batter is gone and pancakes are cooked. 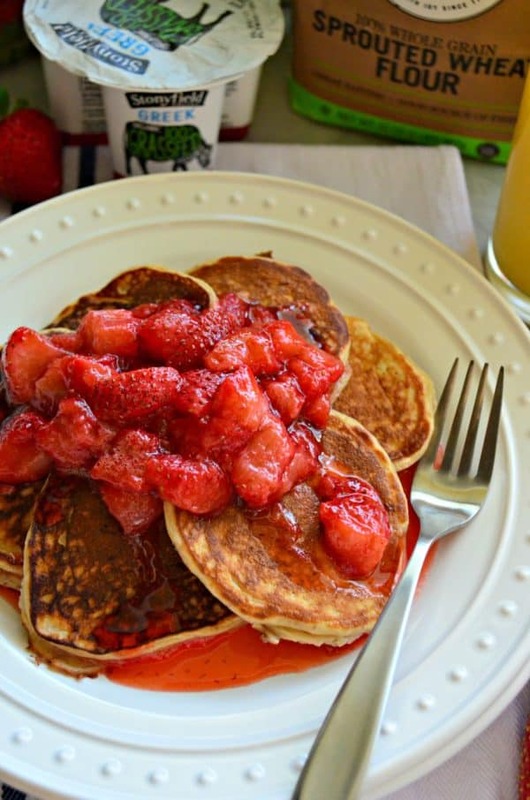 Top pancakes with the strawberry syrup, and enjoy immediately.